Sandy has come and gone. I went out today with the kids to see what the storm had done to the area. 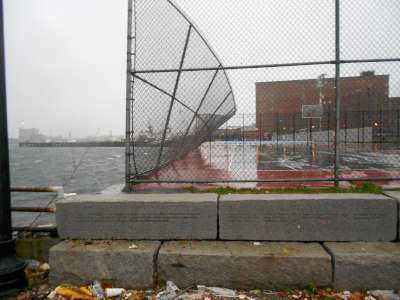 We went down to the waterfront and the only damage we came across was the fence at the basketball court was down. We checked out all the other places we went yesterday and other than little bits of debris that washed up everything looked fine. The tide was really high but there was no way it was going over the walls today. I think we were all a little disappointed there was nothing to see. We made it down to Long Wharf and it started raining again so we turned for home. We walked by the Chart House that was surrounded by the ocean yesterday and they had put the patio tables back out. That sums up the aftermath of the Frankenstorm Apocalypse in the North End/Waterfront area from what we saw.